Cheshire East Council (CEC) have revised their Local Plan and it is now open for public consultation. This Plan, if passed, will have a major impact on Woodford. It will mean Woodford will be surrounded by some 5,000 (This includes the already planned 920 homes to be built on the ex-BAe Woodford aerodrome site) new homes within a two mile radius of Woodford Church. Such developments will mean huge incursions being made into the Green Belt in Poynton and Handforth. 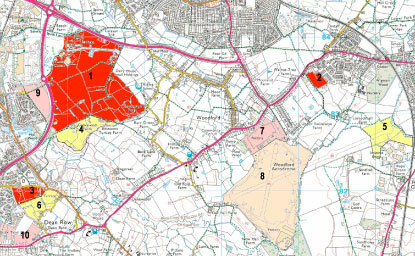 Please click on this map to be taken to a larger scale map, a key to the proposed development areas and details of how you can respond to these proposals. The deadline for responses to be received is only a short time away, 19th April 2016. You can respond online, by email or by post using this reponse form.